Michelle Williams' mesmerising transformation into Marilyn Monroe in My Week with Marilyn is already garnering Oscar buzz. But with the film's star a no show at the London premiere tonight, it was up to Emma Watson to step into the spotlight to promote the British movie on home ground. And the ever-stylish 21-year-old was up to the task, dazzling on the red carpet at the Cineworld complex in Haymarket, central London. 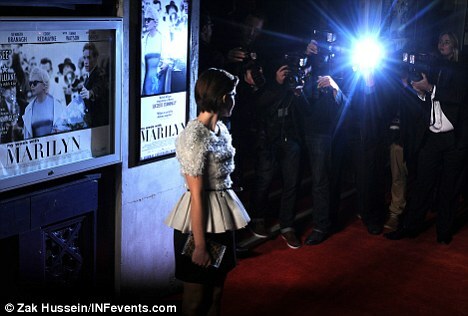 Emma looked prim in a black skirt and white embellished top from designer Jason Wu's Spring/Summer 2012 collection. Her gamine crop was slicked into a side part and her make-up kept fresh and youthful. The actress and Oxford university student has received fantastic reviews for her first major film role post-Harry Potter. Watson plays wardrobe mistress Lucy in My Week with Marilyn, opposite the film's protagonist Colin Clark, played by rising star Eddie Redmayne. Redmayne posed alongside Emma and Kenneth Branagh on the red carpet at the screening, but Michelle Williams and Dame Judi Dench were unable to attend. Williams' portrayal of Marilyn is winning stellar reviews all over the globe, with rumours that another Best Actress Oscar nomination is expected in the New Year. The film is based on Colin Clark’s memoir of a week as a third assistant director, or dogsbody, on an indifferent British film comedy, The Prince and the Showgirl. He says: 'Williams has given exquisite performances before in Brokeback Mountain, Blue Valentine and the little-seen Incendiary. But it’s here that she is at her most magical, brilliantly capturing Marilyn’s voice and physical mannerisms. 'Never content to play her as a victim, she captures both her emotional neediness and her power to entrance, on and off screen. My Week with Marilyn, also starring Dame Judi Dench, Dominic Cooper, Dougray Scott and Julia Ormond, opens in the UK on November 25.